Do you want to make your own gourmet meal in the comfort of your own home? Or are you looking for a new date night idea? Here is a solution for you to consider. 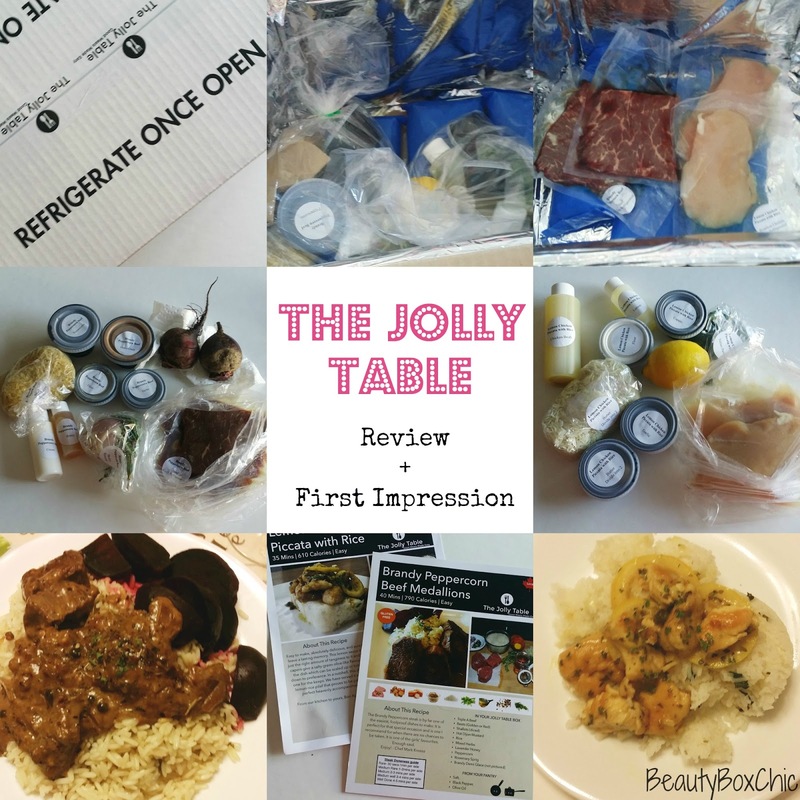 Back in December 2015, I tried out The Jolly Table home delivery service for the very first time. Do you want to learn more about The Jolly Table ? Read on to discover what they have to offer! What is The Jolly Table? 3. 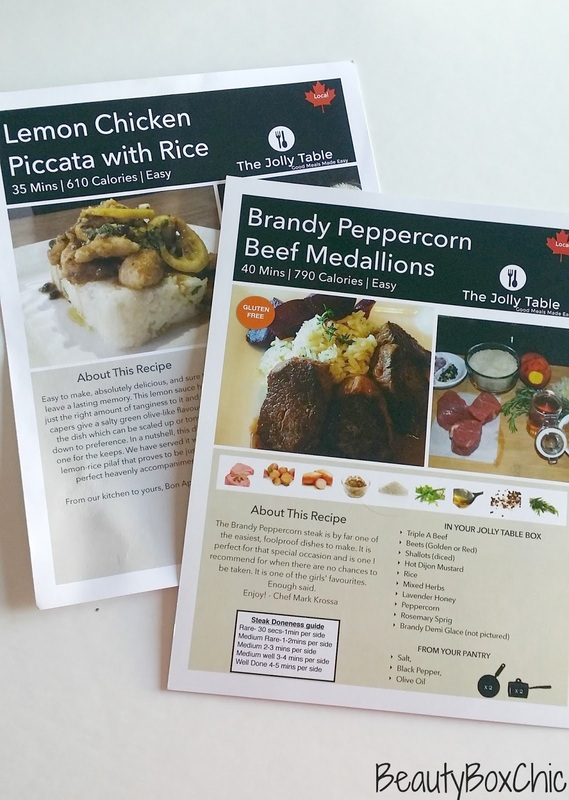 They include simple step-by-step recipe cards as instructions (see below for pictures), you can also download their recipe cards online. 4. You cook in the comfort of your own home and Enjoy! How to purchase the Jolly Table? You can order online. Click Here for more information. What is Basic Trial Pack? This package include two meals for two people. I purchased this during their promotion period back in early December 2015. It cost me roughly $47 dollars with taxes. Jolly Table delivery this package to my house. 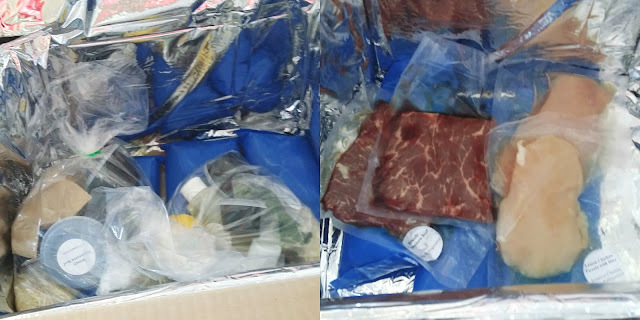 What was inside the package? -can be pricey especially for students and newly married couples. What was included in my Basic Trail Pack? This is my first time trying Jolly Table, it was a wonderful experience trying out their Basic Trail Pack. This was definitely a great way to venture out and make gourmet meal in the comfort of my home. 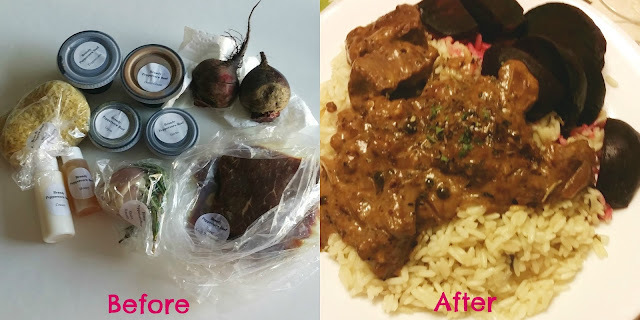 My favorite recipe out of the two is the Brandy Peppercorn Beef Medallions, I love the combination of the red beets with the Triple A beef. It was a lovely combination! In addition, I really like how The Jolly Table support local producers.The ingredients they provided in each box were fresh!! 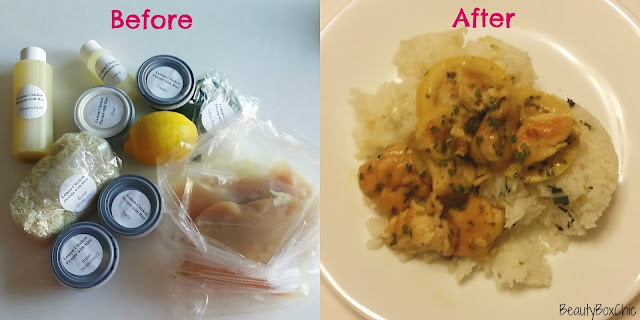 Both meals tasted amazing and very delicious! On the other hand, for two home cook meals, their prices is slightly higher when there is no promotion. However, I was still amazed at how wonderful each meal turn out. I definitely do recommend checking them out as I really enjoyed this cooking experience. Maybe someday I can also try out their subscription services too! What do you think of The Jolly Table ? Will you give it a try? Have you tried something similar to this type of service? I think this is a great idea for people who don't know where to start when making a gourmet meal or for people who don't have time (or the want to) to shop for that special meal. It would be fun to try. THat's really cool! I love how they give you everything you need to make a delicicous, gourmet meal at home! I would totally love to try this kit! This is such a great idea. I always want to try new recipes but never know where to start. The Jolly Table would be perfect for me! What a fantastic idea! Sounds like a great business, I wish there was a service like that around me. I'm trying now a gourmet meal plan being delivered daily. This is also something I could try as it's easier to prepare when they package the ingredients. I've seen a few meal boxes like this around, this one seems really nice! I love that they use local and small producers to source their ingredients. I can see how this can be very helpful! Especially with our busy schedules. Looks like a great service, I love the name because I am a Jolly type of person. Not sure it delivers to Austin, Texas, but the food looks delicious. I would love to have a gourmet dinner delivered to my door. Both meals look great. Wow I love the concept of this box! 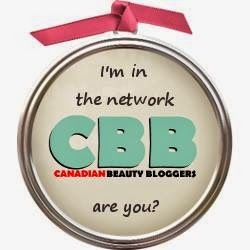 I would love a step by step instruction and ingredient for gourmet meals! Jolly Table is indeed very interesting. I do not know, however, if their type of service is meant for someone like me who likes to cook and experiment with my own recipes in the kitchen. But glad they offer a service like this as an alternative. What a great idea for busy people who want to cook from home! I don't know if I'd do it, but it looks really easy. I've always thought about trying this type of a service as I'm the worst at cooking! But the price point is so high! Almost same as eating out a quick meal. What a great idea! It does seem pricey for an everyday thing, but for special occasions it would be fun and a good way to expand one's cooking repertoire!